I was not always a white girl. I used to be just Charlotte. A person named Charlotte Halsey. But when I met Milo, when I fell in love with him, I became White, like a lit light bulb is white. In the mirror there is my skin the color of sand, hair the color of butter, eyes blue as seawater. Just so bleachy white I am practically clear. Milo is black, what they call “Black,” only not to me. To me he has mostly been just Milo. They say lovers can find each other just by using the sense of smell; that we are all really animals in that way, no different from dogs or deer. I know it’s true. I could find Milo blind in a room of men, the smell of him like pine trees in a snowy wind. I could pick him out just by the slow rising of his breath while he slept. So no, until this happened, up to the time of the assault, he was not black, not to me. He was Milo. He was my husband. As Kate Manning’s riveting debut novel begins, a thirty-five-year-old white woman lies secluded in her home overlooking the Pacific, unable to speak, recovering from a violent assault that has nearly taken her life. Her husband, a famous black actor, is in jail for the crime. Is he guilty? She’s not sure. She remembers nothing of the assault. Longing for answers, she sifts through the history of their life together, trying to determine how two people once so in love might find themselves so ruined. Charlotte Halsey and Milo Robicheaux met briefly in college in the 1970s, where she was a beautiful, troubled girl hungry for freedom, and he was the star athlete with Olympic dreams. Years later, when she is a successful model and he a famous sports hero turned actor, their paths cross again in New York City and they fall in love. But their marriage is soon fraught with tension. As Milo’s celebrity skyrockets, motherhood ends Charlotte’s career, leaving her increasingly alienated from the man she believed she knew so well. Jealousy and mistrust grow between them even as they strive to build a life together against increasing odds. 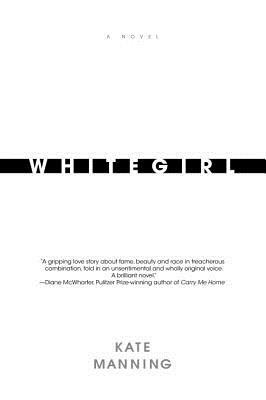 A poignant anatomy of a marriage undone by the pressure of fame and the struggle for identity, Whitegirl is the arresting debut of a significant new voice in contemporary fiction. Kate Manning is a former journalist and television producer. She lives in New York City with her husband and three children.